Kyaw Hsan is trying to bridge the deep rift between his own ethnic Rakhine community and the Rohingya minority in Rakhine State, where 700,000 Rohingya were driven out last year in a purge the UN says could amount to genocide. But he faces a monumental task countering generations of hatred and distrust that culminated in last year’s humanitarian crisis. Kyaw Hsan and other local peacebuilders here in Rakhine State are often forced to work in the shadows, facing threats from sceptical hardliners and increasing government restrictions. "The communities are now even more polarised than before,” he said. Yet the civil society group he runs, PDI Kintha, and other local groups are determined to try to change the deeply entrenched attitudes that led to ongoing ethnic violence, starting with young people in both the Rohingya and Rakhine communities. They hold social studies classes, mixing in English lessons and job skills training with broader discussions about violence. But even using the term “human rights” in their workshops is out of the question – seen by many here as analogous to promoting rights for the Rohingya. Generations of Rohingya have been excluded from citizenship in Myanmar under the country’s race-based citizenship laws. Many in Myanmar see them as illegal immigrants from Bangladesh – particularly in Rakhine State, one of the country’s poorest regions. In 2012, riots erupted in Rakhine and spread to other parts of the country after rumours emerged that a Buddhist woman had been raped and killed by a group of Muslims. People from both communities attacked each other. Roughly 200 people died. Here in central Rakhine, some 120,000 Muslims – most of them Rohingya – were forced into barricaded camps, where they have become almost entirely dependent on humanitarian aid to survive. Rohingya throughout the state face apartheid-like segregation and restrictions on their movement. Kyaw Hsan’s workshops don’t address these tensions directly. Instead, he spurs discussions about participants’ own experiences with violence, letting the topic of ethnic conflict emerge organically. Kyaw Hsan started his organisation six years ago when Myanmar’s former military junta rulers were beginning to loosen their control of the country. At first, he wanted PDI Kintha to support the fledgling democratisation process. But after the bloodshed in 2012, he quickly realised he needed to focus on healing the fissures among ethnic communities in his home state. A group of ethnic Rakhine people attend a storytelling workshop in Sittwe run by PDI Kintha, a local peacebuilding organisation. At a recent class in the provincial capital, Sittwe, Soe Sandar Oo sat in a circle with eight other participants. Like her, they are ethnic Rakhine Buddhists and, like her, they grew up with prejudices against their Muslim Rohingya neighbours. As a child, Soe Sandar Oo was taught to fear the Rohingya. Her ethnic Rakhine parents would warn her that the “kalar” – a derogatory term for Muslims in majority-Buddhist Myanmar – would come for her if she refused to do her homework. Now, the 21-year-old wants to learn how to build bridges between the bitterly divided communities. “People have to start to listen to each other, or we will never have peace in Rakhine State,” she told IRIN. For now, Soe Sandar Oo’s class is made up entirely of other ethnic Rakhine. If all goes well, they’ll later merge with Rohingya participants. There’s no quick fix for the generations of hatred that led to the riots here in 2012, or to last year’s Rohingya exodus from northern Rakhine. Myanmar has resisted international pressure over its treatment of the Rohingya, insisting that it is building “inter-communal cohesion” on its own terms. Rights groups have called for Myanmar’s top military generals to be prosecuted at the International Criminal Court. Over the long term, however, any lasting change will come from the local peacebuilding efforts already on the ground, said Anthony Ware, a researcher at Deakin University in Melbourne who specialises in community development in Rakhine. Within Myanmar, international criticism is easily dismissed as naivety or an attack on the country’s sovereignty. While media coverage has frequently focused on ample examples of visceral hate speech against the Rohingya in Myanmar, there are also more progressive views to be found. But international donors looking to invest in peacebuilding initiatives have also stumbled trying to find the right voices. This year, Internews, a US-based media development NGO, collaborated on a reporting project with a local newspaper in Sittwe, the Development News Journal. Aung Marm Oo, the paper’s editor-in-chief, told IRIN that Internews was not happy with his paper’s reporting. He believed it was because his newspaper referred to Rohingya as “Bengali” – commonly used in Myanmar to imply that the Rohingya come from neighbouring Bangladesh, rather than Rakhine State. Peacebuilding is one of his paper’s main missions, he says, but using the name “Rohingya” is impossible. If he did, he says, he would likely be shut down by government authorities – or worse. In a statement, an Internews representative said the concern was more focused on the quality of the paper’s reporting. Internews asked the newspaper to improve the “tone and conflict sensitivity” of its reporting: “There was some progress, although challenges remain,” said Michael Pan, country director for Internews in Myanmar. He added that “conflict-sensitive” journalism can contribute to peacebuilding. The work of grassroots groups like PDI Kintha is funded by grants from a range of international donors. But in general, finding the right local partner is a common pitfall for international agencies looking to support peacebuilding programmes in divided Myanmar, according to a representative from a US-based donor that works on hate speech. "They know what we want to hear. But if they really believe in it, is another question,” said the representative, who asked not to be identified because the issue was considered sensitive. David Mathieson, a Myanmar-based conflict analyst, believes the difficult work of building social cohesion in Rakhine State is a long-term process that must be powered by locals themselves. “There’s a lot more localised peacebuilding going on that foreign eyes don’t always discern,” Mathieson said. But the tense work of building peace has become even more precarious since last August’s military crackdown. Kyaw Hsan says security is tighter and he finds it harder to get permission to run his workshops from local authorities here in central Rakhine as well as in northern Rakhine, the flashpoint of last year’s violence. 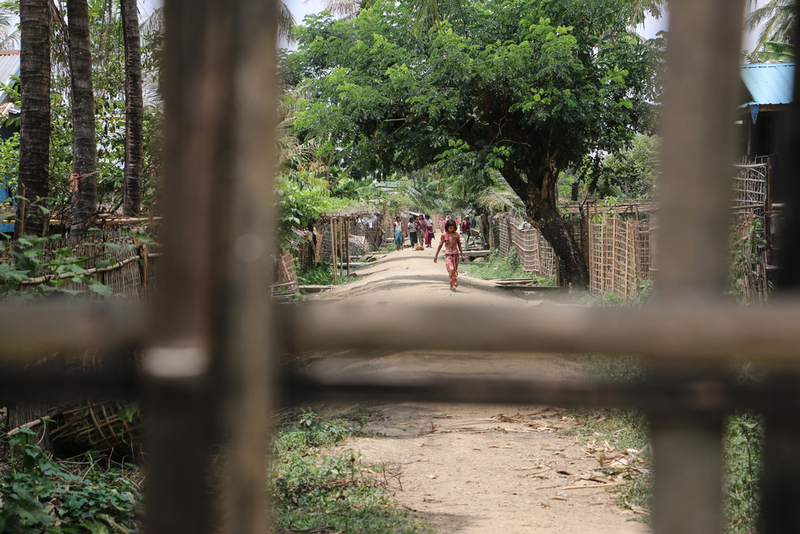 At the same time, Rakhine parents are increasingly wary of sending their children to classes with Rohingya, while young Rohingya hoping to attend are often shackled by restrictions on their movements. Some local peacebuilders say they face threats and public opposition to their work. Htoo Htoo, a consultant from Yangon who ran peacebuilding workshops for an international organisation in Rakhine, quit his job this year when he was threatened by both Buddhist and Muslim residents in one village. Both groups were upset that he was working with the other side, he says. Htoo Htoo left his job, frustrated and afraid for his life. "Peacebuilding is really risky," he said. He asked that his real name not be used. Other local civil society leaders also prefer to work away from the spotlight. "If people know too much about what we are doing, we might be isolated, if not attacked,” said Ye Linn Aung, who runs a separate organisation that works with young Rakhine and Rohingya. He asked that his organisation not be identified and for his real name not to be used. People to People, a Sittwe-based peacebuilding organisation, also holds workshops for young people from both communities. Like other groups, the organisation doesn't advertise its classes as teaching “human rights”. Instead, they’re often disguised as education measures, aimed at engaging on more palatable subjects like English classes and skills training, rather than addressing ethnic tensions head on. "Here, when you say human rights, the people think you advocate citizenship for the Muslims," said Nyi Nyi Zaw, a 25-year-old instructor with the organisation. He recalls criticism from hardline Rakhine nationalists after the group attended a meeting with interfaith activists a couple of years ago. The organisation was forced to make a public apology before a well-respected monk. "People accused us of working with the Muslims and betraying Rakhine State," he said. Nyi Nyi Zaw, an ethnic Rakhine, understands the roots of his community’s hatred and fear: he once felt the same way about the Rohingya. During the 2012 violence, he saw photos on the internet that purportedly showed local Rohingya killing Rakhine civilians. Later, when he attended classes run by the same organisation he now works for, he learned the photos were fake – taken from another country’s conflict. "I used to be blinded just like the people who come to our trainings," he said. While reversing generations of distrust won’t happen overnight, local peacebuilders here believe creating opportunities for young people to share their feelings is essential to fostering long-term understanding. While the UN says Myanmar’s military was responsible for the worst of last year’s anti-Rohingya violence, Rakhine civilians also took part. "If you address social cohesion, then this type of violence will at least be less likely to happen," said Kyaw Hsan, the PDI Kintha founder. Ye Linn Aung believes people in Rakhine need an “attitude change” – that’s the long-term goal of his organisation’s workshops. For now, he’s planning a new topic for an upcoming social studies class: a lesson on the 1994 Rwandan genocide. Bluntly addressing last year’s Rohingya purge in northern Rakhine State may be off limits, for now. “But if all goes well, the students will connect the dots,” he said.